What’s the Best lawn mower for a small yard? We discuss and review a wide range of push lawn mowers for your little yard. Not everybody needs a riding mower, nor can their lawn fit one. In many cases what you really need is a compact lawn mower, no bigger than 21-inches. Bigger isn’t always better, if you have a narrow lawn. There are a few things we need to consider when deciding on the best mower for your specific yard. To start with, what is a small yard? The average lawn in America is about one fifth of an acre for 85 million households with a private lawn. It varies from 0.05 acre or 242 square yards in Washington DC to half an acre in Georgia. Half an acre is 2420 square yards, or less than 50 by 50 yards. Another trend is that people are happily downsizing their lawn for bigger houses. The average size of a lot is about 0.19 acres and it seems the median garden is only 0.14 acres. That’s less than 678 square yards or roughly 26×26 yards. Depending on the garden’s layout, and size of flower beds, the lawn patches can be small and scattered. There’s also an increasing tendency to have rock gardens and drought resistant yards. City dwellers have even smaller patches of lawn. Why does the size of the lawn mower matter in a small garden? A big unwieldy lawn mower may be a bad choice. You may think that it will do the small area faster than a small lawn mower, but it is not necessarily true. It’s meant to cut wide areas and move around on big lots, but in a small garden it’s just too big. A small mower will fit into tight spaces, in-between flower beds and rocky outcrops. It follows the edge of a winding path a lot easier and it’s easy to move from one patch of lawn to another. For a small garden with small patches of lawn, bigger is not better. You must carefully consider maneuverability over size. Do You Have Hills in Your Yard? Another consideration may be the slope of the lawn. A heavy mower with a gas engine is not what you want because you must fight the weight of the mower all the time. Even when the lawn mower is self-propelled, when turning and backing up it’s you that move the mower. Sometimes the shape and slope of the lawn will see you moving forward and back a lot. Remember, your lawn is most active in the summer when temperatures are higher and more tiring at the same time. I don’t even consider a self-propelled lawn mower for a small garden. My lot is about 7654 square yards and I use an electric lawn mower with a wide cut. Not everyone will consider that ideal, but I manage, and the lot only has a barely noticeable slope. I do that because I move in and out of tight spaces a lot. I follow winding pathways and mow around huge trees, and the wife’s ever expanding flower beds. I considered a gas powered self-propelled lawn mower when we started the garden. Fortunately, my preference for an electric mower and the wife’s idea of a dream garden turned that into a distant dream. Should you Buy A Corded-Electric? I use an electric lawn mower and not a gas powered one. It’s because our environment is dusty and I experienced just too many frustrating Saturdays repairing the gas mower before I could use it. I used it for two seasons and swapped with my brother-in-law. The electric lawn mowers last 10 to 20 years in this environment with no hiccups. The body and wheels wear out long before the motor fails. Managing the cord and extension cords is an over-rated problem. When I started off it used to confuse me too, but now it all comes naturally. It needs a small amount of planning. Visualize the area you need to mow to find the center left of the area. You want to drop the coil of cord near the center and to the left of the area you wish to start with. Then you start from the left, move past the center to where you must turn around. You turn with the mower pointing away from that center point. It allows you to move to the right freely and only when you turn around you pull the cord tighter. The idea is to always turn away from the starting center point. Doing it like this you always know where the cord is and even when you must back up you are aware of its presence. Because I use an electric lawn mower, I have an external receptacle on four corners of the house and in the garage. The point I’m making is that I manage in a big garden with an electric mower that’s not self-propelled, because I choose to. So, for a small garden an electric or battery powered mower is a sensible choice. I had a small garden once, it’s not that I do not understand its requirements. That is when I made the wrong choice to select a bigger mower than I needed, “to finish the job sooner”. It’s where I learned that mowing a small lawn with a big machine can tire you. The wife enjoyed the small garden, and she still planted a lot. We had all those foot paths, stepping stones and water features I had to maneuver the mower around. I found that in a small garden you need a good powerful edge cutter, you’ll use it more than your mower. In fact, a friend of mine has a small patch of lawn and he manages with an edge cutter only. He should have considered the edge cutters that fit into a base with four wheels. Something like the Black+Decker MTC220 three-in-one cordless edger, trimmer, mower I will discuss later. Lawn mowers have come a long way in the past 60 years. A friend of ours has a beautiful flower garden, full to the point of being overgrown. She has three patches of lawn plus the sidewalk and everything has branches, flowers, and leaves overhanging the lawn edges. Water features, gnomes and pots with flowers are mixed in between some trees. It’s small, yet mowing the lawn is a slow process. It is not because of the small lightweight, cordless mower, but because you must be careful that you do not damage the plants. The garden is also hilly and rocky, using the small 12-inch mower is the most sensible thing to do. I think you get my point. Small garden, small lightweight mower. My choice would be a cordless or electric. Another consideration is your choice of lawn. If it looks like so many ads of a new home, lumpy and uneven, I could even consider a self-propelled mower. Maybe a Snapper XD MAX 1687914 21” 82V self-propelled cordless mower. If you prefer, a gas powered, Remington RM210 Pathfinder 21” front wheel drive self-propelled mower. For a lawn that looks like a bowling green, consider a machine like the Fiskars 362050-1001 18” reel-type manual push mower. A reel-type mower will give you that clean-cut well-manicured lawn. Any lawn mower is easy to move around on the smooth surface of such a lawn, even a manual push model. When you consider a self-propelled mower, determine if the system drives it by its front wheels or rear. I prefer the front wheel drive; it makes it easier to maneuver the mower. To make a turn or a short reverse out of a tight spot, you press down and lift the front wheels. There’s no need to reach down and disengage the drive system, which you will have to engage again after making the turn. Some debate is always around about the virtues of mulching vs composting the clippings. During such discussion the same question often arises, why side discharge? Some experts believe it is better than mulching, the clippings still end up on the grass, better distributed and more even. You should do it often so you clip only 1/3 of a crass blade, and the lawn will look better than with mulching. Yet you obtain the same benefits. Another advantage of side discharge is that the blade cuts the grass once and not many times as when mulching. Even wet grass exits the machine better than any other method; therefore, the underside remains cleaner. The load on the motor is less and the mower cuts better. On cordless machines these are important considerations because it extends battery life. 21” clearing width — 82V self-propelled — Includes two 2.0 Ah batteries and rapid charger. Snapper did a great job in designing this mower. Over-molded rubber handle is comfortable to hold. This Snapper XD MAX has a 21-inch steel mowing deck. You can use this mower to mulch grass clippings and cycle freshly cut grass back into the lawn with your lawn mower. It has the same benefits as a compost, and at the same time saves you a lot of effort compared to bagging. If you prefer you may collect the grass clippings in the 2.1-cubic foot grass bagger. You may also let the mower discharge to one side to better distribute the clippings. The cutting height is adjustable with a single lever that uses a seven-position indent plate to hold the lever at the preferred height. The brushless motor of 1200-watts promises a long life, and lots of low-down torque, power and the reliability you need to mow your yard. A Briggs & Stratton 82V Max (82Li Series Technology) 2Ah Lithium-Ion battery provide power for the brushless motor. Optional 4 Ah and 5 Ah batteries are also available. With the mower they provide two 2 Ah batteries and a battery charger. The batteries are compatible with other Snapper XD 82V Max Products. The maximum initial battery voltage when first charged is 82-Volts, thereafter it drops to the nominal voltage of 72 Volt. The batteries can last up to 45 minutes each and it is quick and easy to swap the two when you need power. Charging a battery takes longer so your real run time with two batteries is about 80 minutes. Run time and output capacity will change in accordance to the mowing conditions. With the goal of extending the run time they use load sensing technology which adjust the power dynamically. It adjusts the power to the load on the cutting blades, and you can adjust the forward speed with the easily accessible speed control lever. The molded rubber handle is comfortable, and it folds over for more convenient storage. You may even store the mower vertically to get it into tight spaces in the shed. The push button start, safety pull lever, and speed control are all within easy reach. Model : GLM801602. Runs up to 60 minutes on a single charge (includes 4 Ah battery). As powerful as a gas mower but better in my opinion because it’s quieter, no fumes, lightweight and requires very little maintenance. Also, includes a rapid charger which will charge the battery in 60 minutes. Makes cutting your lawn easy. No cords, no fumes. Greenworks PRO 80v GLM801600 : Mower only. No battery or charger. ✓ View or download the MANUAL for the Greenworks 80V mower. The Greenworks PRO uses a cordless and brushless motor to power a mower of 21 inches wide. Like the Snapper it can cut up to 45 minutes with a fully charged 2.0 Ah li-ion battery (60 min. with 4Ah battery). Remember, brushless motors are more reliable and should last a lifetime. They also provide power equivalent to a 160cc gas engine, but with full torque from start-up. The controller of this brushless motor uses SmartCut load sensing technology to vary the power according to the load on the motor. The manufacturer designed the mower for use on a 1-acre lot, they include two 2 Ah batteries and rapid charger with the mower. However, the feedback from users are that a battery lasts for a 1/4 acre mowing. It means your two batteries will do about halve an acre. The Rapid charger can charge the 80V 2Ah battery in 30 minutes. Keeping in mind the average lawn in America is about one fifth of an acre, this mower is perfect for a small yard. The blades, according to feedback, cut very near to the outer edge of the wheels. It makes it a lot simpler to cut close to edges and minimize trimming. This is a 3-in-1 machine. It can mulch, be used with the rear bag to collect clippings, or use it with the side discharge. I read almost all the reviews for this product I could find and I’m disappointed by the very negative feedback. It’s clear that customer services are difficult to reach and some are rude too. Almost all users that phoned in reported hanging on for long periods and that they had a negative experience. Many had issues with dead batteries and one user bent the shaft on the motor. I do not have the figures to balance out the negative to positive feedback on all sites. 20% of the feedback on the Amazon site was negative or critical. Unfortunately, based on what I read, I got a negative feel about this product. On a more positive note, GreenWorks responds to negative reviews and always offer additional support. If you’re interested in the mower but concerned about their level of support, call them first and see how quickly they answer the phone and ask them pointed questions about their warranty and support. Find out for yourself how good their customer service is. Personally, I recommend you do this with any manufacturer before you invest a lot of money in their products. Check for yourself before you spend your money. The positive reviews are good. The mower works well and good batteries last up to an hour. Solid gas lawn mower for the money. ✓ View or download the MANUAL for the Remington RM210 Pathfinder. The ever-present gas engine lawn mower in our selection has a powerful 159cc OHV engine. The motor has an auto choke to simplify start-ups in cooler weather and it’s manufactured by MTD Products. MTD was originally the Modern Tool and Die company, an American manufacturer of bicycles. Now they manufacture Cub Cadet, Troy-Bilt, Columbia, Yard Machines, Remington Power Tools, Arnold, Bolens, and Wolf Garden. The Remington is the last 21-inch mower in our list and they manufacture this one from rust-resistant steel to extend its serviceable life. It has 8-inch wheels to move over rough terrain with greater ease. The Remington mower has the front wheel drive system that I prefer because it’s easier to maneuver the machine. The dual-lever height adjuster has one lever on the front wheels and another on the rear wheels. The levers have 6 height settings and adjustable grip. Feedback from users are that it is easy to set the height but you must remember to set both levers to the same height. The Remington RM210 Pathfinder is another 3-in-1 lawn mower. It means you either bag the clippings, eject it to one side onto the lawn or mulch it and discharge to the bottom. The adjustable handles have a comfortable, adjustable grip that allow you to work upright and save your back. Some feedback is that the bag does not work well, so it’s not used. Some machines did not have instructions for assembly and came without a manual. All feedback is that the motor is easy to start, and the mower works well, it feels light when you lift the front for a turn. The Remington mower includes a 2-year limited warranty. Perfect for small lawns if you’re environmentally conscious. The Fiskars lawn mower differs from the reel type lawn mower I used as a child. That old design was hard to push, even on soft grass with a smooth, firm base. It was hard work, but this new design does not have the blade and cutter making contact like that one. Therefore, the only effort you put in is to spin the blades, making it 60% easier to push than conventional reel mowers. It drives the blades from the rear wheels by a chain drive and you provide the power. There’s no gas, battery or electricity to power the mower. It cuts an 18-inch-wide path while you push it. This mower is great for a lawn that is smooth and firm. You should mow the lawn often and keep it to the required length. The idea is to cut less than 1/3 off a blade of grass, then the task is easy and the results perfect. Because there is no blade contact with the StaySharp system the blades require less sharpening. Adjusting the cutting height is quick and convenient with a single lever from one to four inches. They set the wheels inwards so that the blades extend across the full width of the mower. It makes it easier to mow next to walls and to mow the edges of sidewalks. You can also direct the grass clippings forward, away from your feet or direct it down into the lawn by positioning the grass chute. They advertise it as ideal for cutting all grass types, even tough southern varieties like St. Augustine, Zoysia, Bahia and Bermuda. But feedback from users say no, don’t use it on the tough varieties. The feedback is generally good with some commenting that this mower can be easier to push than a gas mower. The general feeling is that if you cut frequently, you will love this mower. A word of warning though. On the Amazon site, 30% of the reviews are critical. From that a common complaint is turning it through 180° is not too easy, but manageable. You should not use it on lumpy grass with divots, the wheels are too small and will dig in. Your lawn must be smooth and free of sticks and stones, once you damage a blade it does not work well. It’s also not good at cutting weed and less desirable grass. The manufacturer covers it against defects in a limited 3-year warranty. Innovative pivot handle makes it easier to maneuver. Let’s say your patch of lawn is just an open square patch of grass, and you decide to use an electric model. You may consider something like the Black+Decker BEMW482ES which is ideal for 1/8 acre. They sell this machine with almost two feet of cord. You must buy an extension cord, and my suggestion is to open the owner’s manual first and determine what you need. Most likely a 12-gauge cord or heavier, like a 10 gauge. Be sure it will fit the plug. The benefits of using an electric mower becomes clear when you realize you can tip it over. When it is upside down, you can inspect the underside without spilling gas and oil. You can hang it up against the wall when storing it or store it on two wheels. To use it, you connect it to power and go with the push of a button. You can adjust the cutting height of the Black+Decker in 6 increments from 1 inch to 3 inches. It is a 12 Amp 120 Volt (1440 Watt) motor that drives the 17-inch blade of this electric lawn mower. The 17 inch cutting width is already a clear indicator they intend this mower for a small lawn. It is tiring to mow a large lawn with a narrow machine, even though it will be willing to. The handle is not the normal bar type with pull type levers but what Black+Decker refers to as a pivot control handle. It has two upright handles with a squeeze control that seems to be more comfortable to use than a bar. More than one user commented that they tripped and fell, breaking a handle. When you do not collect the grass clippings in the bag a transparent flap closes, and it forces the clippings down into the lawn. To my mind that is mulching; but many reviewers say there is no mulching function. What is missing, is a side outlet chute to eject the grass clippings to one side. The perfect compact mower that does it all. AUTOMATIC FEED SPOOL – AFS ensures continuous work without bumping and having to stop to adjust the spool. PowerDrive Transmission prevents bogging down in heavy grass and weeds. This is an intriguing idea that works well for those who use the little Black+Decker MTC220. It is not a mower but an edger, trimmer, or edge cutter. It is unique because it has a special base with four wheels it can clip into so you can use it as a mower. It’s ideal for a property of about 750 to 1200 square feet. This little edger/mower has a small footprint, and it only weighs 7 pounds. It’s lightweight and small footprint ensure that it will fit into tight spaces and be easy to use on inclines. The greatest advantage is that it works as an edger, trimmer and with the addition as a small mower. It attaches to the base by clipping in and you easily remove it with a foot pedal. It takes up little storage space, and it is easy to clean and maintain. It is a cordless tool with the advantage that you plug in the battery and it is ready to go. You do not have to content with gas, oil, fumes and noise and not even with a cord. If you choose to, you can use a corded version of this model. Another feature I liked about this model is that the cutting line feeds automatically, keeping to the correct length. When used a mower the cutting width is only 12 inches, but it’s perfect for a small space. The mower deck has two height positions that adjusts all four wheels. It uses the BLACK+DECKER 20-volt MAX lithium-ion batteries that has a nominal voltage of 18 Volts. 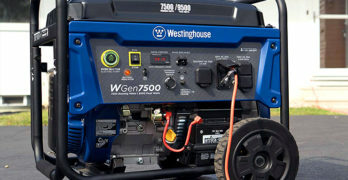 It is the same batteries used in the 20-volt MAX line of power and gardening tools. By now you should have a feeling for the correct size mower for your small yard. It is important to choose wisely, and it is not because this is a major expense, but because the mower should fit your needs. When you live in an enclosed area with a small garden, and your neighbors within hearing distance, a noisy gas-powered lawn mower is not a good choice. For a lawn that you can mow in less than an hour, I would seriously consider a cordless model. Although my personal preference would be for an electric one, because I find the cost of battery power too high. I used battery powered tools before, and although it is convenient; my experience is they do not last. Electrical tools on the other hand, last a lifetime and require little or no maintenance. The models we looked at vary from 12 to 21 inches wide. For a lawn that is less than 1/4 acre, a push reel mower, battery or corded mower will be a good fit. For bigger lawns the wider models like the 21 inch Snapper and GreenWorks will require less effort. If the mower is too wide to fit into lots of tight areas, you will need to use a trimmer to clean up with. Something a narrower mower could avoid. If this sounds like your garden, I suggest walking around the garden to make sure the mower you fancy will fit. Another option is to consider a wider mower for the open spaces and the Black+Decker MTC220 as trimmer and edger. Mounted on its wheels, it will be a perfect alternative for those small spaces that the bigger mower does not fit into. Beyond an acre I would suggest a wider than 21 inch model and possibly a self-propelled lawn mower like the Snapper XD MAX. If you live on a tight budget a 21 inch will do if you mow the lawn often. You should be able to cover an acre in 2 hours. If you use the bag to collect the clippings, it will take longer. Depending on the volume of clippings and the size of the bag it can be 3 to 4 hours.